I was only a little fellow, but can now visualise the old home, with four peaked gables, built on the terrace in that lovely old part of town, so near to the beloved river the Maitai. 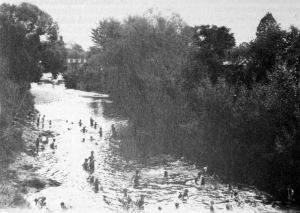 Many happy hours were spent swimming and trying to catch cockerbullies, crawlers and shrimps, after lifting up small stones in the shallows of the river. The river was not deep in many places, and we could paddle across it, holding up our knickerbockers, while the girls tucked their clothes into their pants! My sister Rachel, who was only three years older than myself, was always very keen to join me in my hunting under the stones. I was the baby of the family, number eleven and no doubt spoilt. I have four sisters and six brothers. I was an uncle when I was five years old, being twenty years younger than my eldest sister. It must have been a relief for Mother, Bless her, to have the children away for a few hours, where she knew the water was not deep. We could all swim. I learnt at the age of four to swim under the water. One of my elder sisters, Effie, taught College girls to swim in the Girls’ Bathing Hole, just up the river from the Nile Street foot bridge. I can well remember often going to Wilkie’s Butcher Shop, next to Griffin’s Mill in Nile Street, to get a penny worth of cat’s meat, which was always nice and fresh. Often the penny was not taken by the man. My sister Effie had a pot, which she took when we were taken for a picnic to Almond Tree Flat, just past Sharland’s Bridge. This pot was used to boil onions and potatoes and sometimes, I am afraid, the cat’s meat was mixed in with it. A real Irish stew!